So; you’ve been involved in a serious car accident. You were taken by ambulance to hosptial. They did a few x-rays, scans, gave you some pills, and told you to follow up with your family doctor. Or, the injuries were more serious, and you were an in-patient at the hospital for a few days or weeks, and discharged home or to a long term health car facility (and then home afterwards). Many people ask me where is the BEST place to recieve treatment following their respective car accident. The right answer is that there is no single BEST place for treatment. At the end of the day, it’s important that you attend a doctor or rehabiliation facilty that’s right for you; and that you’re most comfortable with. Rule of thumb: much like going to the gym to excercise; the closer the rehabiliation facility, the greater the likelihood that you will be diligent with your treatment. The longer the commute, the great chance tha you will miss out on appointments. That’s not good for your treatment, and certainly not good for your case. There are some lawyers and insurers who INSIST that you attend at their “preferred” rehabiliation facility, or see their “preferred” analysts. Even if there’s a closer facilty, which you’re familiar with that you’d like to attend, a lawyer or an insurer may recommend that you attend at their preferred facility. This is very odd, but all too common behaviour in our industry. And yes; I refer to the world of personal injury law and car accident rehabiliation as an industry because it’s exactly that. A multi million dollar industry that makes A LOT of people very very rich. First: you should know that as an injured accident victim, you have the RIGHT to attend at ANY facilty that you want to. Just because your lawyer or an insurer says that you MUST attend at one facility, does NOT mean that you have to attend for treatment there. If you’re not comfortable with the facility, or it’s too far out of the way even IF they’re going to drive you; or you just get an “ickey” feeling at the facility; you DON’T have to go there. YOU GO WHERE YOU WANT TO GO. It’s that simple. You’re the boss of your own body. You’re the boss of your own treatment. There are usually reasons that lawyers and insurers insist that you attend at their “preferred” facilities. For insurers; it’s simple. They will send accident victims to facilities who favour their cause. This is masked in the guise that these facilities have “special relationships” with the insurer to facilitate your treatment. There are many LARGE companies/facilities out there whose entire business is based on referrals from large insurance companies. Profits are in the millions. The work flows in droves and waves. If these facilties don’t prepare reports or records which are favourable to the insurer’s cause, then the referrals will likely end, and the money train slows down. The saying “don’t bite the hand that feeds you“, applies here. The same principal can apply to some questionable law firms and lawyers out there. My law firm has offices in London, Peterborough and Toronto. Only in Toronto and the surrounding GTA have I seen a culture of cash and incentive based referrals whereby treatment providers offer to pay a kick back for any referral made to their facility. The deal might be structured in such a way that for every client the lawyer refers to a specific facilty, they will offer a percentage of the treatment plan (10%) or pay a referral fee (like $250 per client treated). This is not only illegal, it’s unethical and is ground for losing a Law Society License. The reality is, this happens every day across Toronto and the GTA. I’ve heard of some lawyers telling their clients that they MUST drive 45 minutes out of the way, just to go to one of these facilities. Clients, who don’t know any better, will listen to their lawyer and go to these facilities which are often like “treatment mills”; where dozens of accident victims wait around in large waiting rooms for 10 minutes of sub-par treatment that doesn’t help rehabilitate. The only people benefiting from this are the lawyer and the treatment providers. The people who ought to benefit the most (the injured party) are being taken advantage of. The reality is that the injured party is gettting hurt twice. Once in the accident giving rise to the injury. The second time not knowing any better and having to be part of the treatment sham. This sort of thing makes me cringe and really upsets everyone at my law firm. If you’re reading this and you’re presently getting treatment at one of these facilities which has been recommended to you by an insurer or by your lawyer and you don’t like because you feel like you’re being treated like a piece of meat for others to profit on; you are FREE TO GO TO ANY FASCILITY FOR REHABILITATION THAT YOU WISH. YOU ARE NOT A PRISONER. The accident benefit system in Ontario is supposed to work for YOU; the accident victim. Get it working for you today instead of being taken advantage of. If you can’t find a proper facilty for treatment because you live in a remote area, sometimes treatment providers will be able to come to your home if your injuries are serious enough to warrant it. Can’t find a proper treatment faciltity or service provider? You can always ask around, or ask your family doctor. They should have a few good names for you. I hope I got my point across with respect to post accident rehabiliation. If you have more questions, feel free to give us a call toll free at 1-877-730-1777 or email us at info@goldfingerlaw.com with your questions. We’re here to help. Enough boring law talk? Sure. Our prayers go out to the 5 RCMP officers, theire families and loved ones who were shot in Moncton yesterday. Just tragic news out of one of the Maritimes great cities. Why is there a picture of Andrew Wiggins on this Toronto Injury Lawyer Blog Post. Easy. 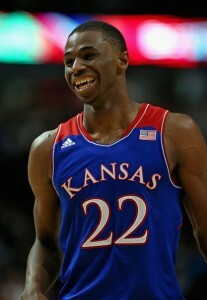 He is my prediction to be the 1st overall pick in the NBA Draft. With Anthony Bennett being drafted first overall last year, that would make back to back Canadians being drafted 1st overall in the NBA. My o My how Canadian basketball has grown since the days of Rick Fox and Bill Wennington being the best Canadian basketball players out there. It amazes me how much guys like Bennett and Wiggins credit Vince Carter while he was a Toronto Raptor as a key to their success. Apparently, Vince’s highlight reel dunks and magical shots were big motivators for both Bennett and Wiggins. It’s apparent that Vincesanity had quite the ripple effect.